The Miami Circle was discovered in August/September, 1998, during routine archaeo-logical investigations conducted at the site of six low-rise, 1950-era apartment buildings (Brickell Point Apartments), which were razed to make way for construction of two high-rise apartment towers. Surveyor Ted Riggs uncovered an arc-like section and was convinced this would be a circle incised into the stone, underneath the three feet of overlying Earth. Considering the amount of modern construction (and demolition) that has taken place on top of the site, the Miami Circle is remarkably intact -- with approximately 85% of it preserved. The Brickell Point property contains intact prehistoric midden deposits on at least 50% - 75% of the parcel. This material contains a tremendous quantity of well-preserved shell, bone, ceramics, and other artifacts deposited during several centuries of human occupation. 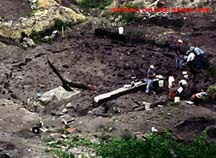 The "mainstream" opinion says "the Tequesta Indians," a group of Southern Florida native Americans who inhabited the area from about 2000 years ago to after the Spanish arrived -- spanning roughly the same dates as the artifacts recovered from the Cicle's "holes." A minority opinion (Riggs, Hoagland, et al) says MUCH older ... by a sophisticated people who lived here long before the Tequestas were in the area ... perhaps as much as 10,000 to 13,000 years ago. * Cardinal points (i.e. North, South, East, and West) along the Miami Circle appear to have been specially denoted. 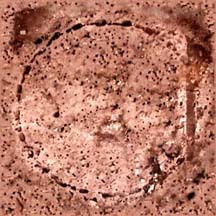 In particular, an eye-shaped hole was cut into the bedrock at the Circle's eastern point. Its shape was unique among hundreds of holes uncovered at the site. * Two possible animal offerings, a complete sea turtle carapace and the articulated remains of a shark more than six feet in length, were found within the Circle's interior. Each was oriented east-west, a practice often associated with prehistoric human burials. * Several teeth belonging to an extinct species of seal were found within the Miami Circle. Spanish explorer's accounts indicate that the consumption of monk seals, or "sea wolves," were reserved for the elite class. * Two finely-crafted stone axes were found found along the Miami Circle's eastern portion. One of these was recovered from within a posthole cut into the bedrock, and possibly represents an offering. Both axes were made of basalt, a volcanic rock that is not native toFlorida. The minority scientists say that the structure's puzzling ring-shaped array of 30 rectangular "basins" are more analogous to England's "Stonehenge" -- once serving as the "foundation slots" for a ring of 30 upright stones, which once stood in the currently surviving geometric bedrock basins -"an archeo-astronomical "stonehenge-like device," for observing the solstices and equinoxes, as well as other astronomically-based ceremonial uses ..."
At present, two radiocarbon date determinations have been completed. Charcoal samples collected from within one of the Miami Circle's cut basins and from the midden within the Miami Circle both dated to circa 100 A.D. Human occupation of the site may date to well over two thousands years ago. The Miami Circle archaeological site is regarded as being of local, regional, and statewide significance. The Miami Circle may also be of national significance, as it is believed to be the only cut-in-rock prehistoric structural footprint ever found in eastern North America. The site potentially qualifies for listing in the National Register of Historic Places. If we fail to preserve the Circle, a priceless , untouched example of a previously unsuspected sophistication in "archaic North American architecture," as well as important new clues as to the reasons for astronomically-based indigenous ceremonial centers will be lost. The Miami Circle, though architecturally unique (carved basins in the limestone bedrock), has at least one other potetially significant analog in North America: the ancient circle of wooden post holes -- called "Woodhenge 2" -- placed on the summit of a massive earthen "Indian Mound" known as "Cahokia," located across the river from St.Louis, Missouri. The Mayor of Miami-Dade County, the Honorable Alex Penelas, signed an "eminent domain decree" last February, setting in motion a legal process for County acquisition and preservation of the Miami River Circle site. An "eminent domain" trial is set to begin October 4th to decide the actual purchase price of the land. If the County cannot raise the necessary funds in time (the exact amount to be dermined by the jury), the land will then revert back to the developer: MIchael Baumann.. The County needs massive financial help, as the current "save the circle" fund is far short of even what the developer originally paid for the land. The developer, Michael Bauman, originally paid slightly over 8 million dollars for the 2.2 acre site at the mouth of the Miami River. He is now claiming additional costs in architetural development, lost revenues due to the eminent domain proceeding, etc., totalling in excess of 50million dollars. Ultimately, based on evidence presented by the County and the developer at trial, a jury of twelve men and woman selected from the normal jury pool in the Miami area will decide what the Circle site is worth in today's market -- and award Mr.Baumann according compensation. The state of Florida has offered 16 million dollars, or half the amount awarded to the developer, whichever is less. A remarkable cross-section of citizens, not just from Miami, but from literally all around the world, began a vigorous protest to local officials via fax and e-mail in late January, arguing against the imminent destruction of the Circle. These calls for preservation on site came from every ethnic group -- Native Americans, white "Anglos," Cubans, Blacks, Asiatics, etc. -- as well as full from professionals and "blue-collar" workers alike. Most passionate were school children -- who clearly saw the Circle as a "hands on" future heritage issue -- and created several major "art projects" around its origins and preservation. In terms of Miami "development versus preservation," local observers all report this level of interest and protest, and the resulting courageous political action by Mayor Penelas to preserve it, has been unprecedented as a direct result. Increasing numbers of archaeological experts, in addition to Miami-Dade County archaeologists Bobb Carr and John Ricisak, have now visited the site since January, 1999, from scientific institutions ranging from the Smithsonian to Harvard. All have come away convinced of not only the Circle's unique scientific importance, but its unique cultural heritage as well. Said Smithsonian scholar Miguel Bretos, "... America's youngest metropolis, the city without a history, turns out to have a far-more ancient and far-more interesting history than anyone dared imagine!" The current owner of the Brickell Point Development Company (and the Miami Circle property), seeking to build twin high-rise towers on the 2.2 acre site, is developer Michael Baumann. The discoverer of the Circle itself was professional surveyor and long-time amateur archeologist, T. L. Riggs. The former chief archaeologist for Miami-Dade County, and still Project Director for the Miami Circle excavation, is Bobb Carr (now Executive Director of the privately-funded Archaeological and Historical Conservancy). His former Miami-Dade assistant, archaeologist John Ricisak, is current Field Director of the Miami Circle excavation. Richard C. Hoagland, former NASA consultant and Science Advisor to Walter Cronkite and CBS News, and 1993 Angstrom Medal winner for Excellence in Science, has been leading the fight for preservation of the Circle. It was through his major media contacts and continuing efforts that national and international attention was first focused on the problem, leading to the political and courageous legal action to "save the circle" by Mayor Alex Penelas. Assisting Hoagland in these vigorous grassroots efforts was the well-known Native American activist, Robert Ghostwolf. 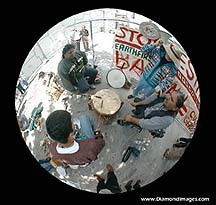 Mark Diamond, a world-renowned photographer, was enlisted early-on by Hoagland to document in digital media the contnuing story of "the Circle"; his evocative 360-degree panoramas and individual stills have provided some of the more moving coverage. David Haylock, Director of VisionEarth Society, an award winning film producer, commited to the preservation and documentation of this Site- created and directs "Save The Circle.org" to continue the fight. And Kynthia, known for her pioneering work in extraterrestrial archeology with her stunning Mars Face Sculpture, is the Art Director of the Save the Circle campaign, building the webstite, creating the logo, and the educational PR materials. "Save The Circle.org" is working closely not only with the Mayor's office of Miami-Dade County in its continuing efforts to Save The Circle, but private research and historical organizations in the Miami area as well. 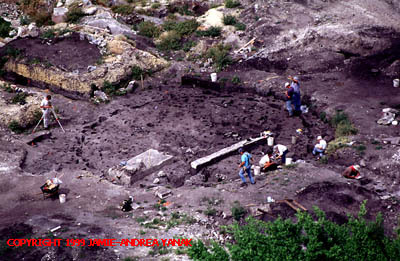 These include the Dade-Hetritage Trust, the largest "preservationist" membership organization in Miami-Dade County; the Archaelogical Society of Southern Florida, a long-standing membership scientific research organization; and the non-profit Archaeological and Historical Conservancy, now headed by Bob Carr, the senior scientist who formerly directed all investigation to date of the Miami Circle for Miami-Dade County. HOW WILL THE FUNDS THAT ARE RAISED BE SPENT? Half the monies raised by "Save The Circle.org" go directly to the Miami-Dade County, to be added to the Fund set up for ultimately buying the Miami Circle. The other half will go to vital documentation and further scientific investigation of this entire process, in Migeul Bretos words "... far-more interesting history than anyone dared imagine!"